Are you looking for a reliable, economical car to rent, which offers you sufficient space for your luggage? 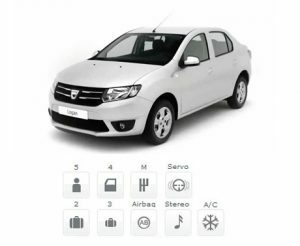 Rent a Dacia Logan with only 18 Euro/day, with no specific signs and with free delivery in Bucharest. Dacia Logan is a low consumption car, ideal for the crowded Bucharest streets, the perfect combination of low price, reliability, safety and space for both passengers and luggage. Also, Dacia Logan offers you safety, especially as the car obtained 3 out of 5 stars at the EuroNCAP tests. Furthermore, through the Bucharest and Otopeni car rental services, offered by FocusRent, you have the guarantee that the car functions accordingly to the technical and environmental requirements. Because we want to offer our clients the most efficient car rental services, after each client returns the car, the vehicle is subject to an inspection so we can be assured of its appropriate condition. Dacia Logan is a genuine family car, offering full comfort for 5 adults. The model, available at FocusRent, offers you an unmatchable price/interior space ratio: a 178 mm knee distance and a 510 dm3 trunk volume in standard position, unbeatable in this segment. Taking into consideration the very generous ground clearance, we recommend to rent a Dacia Logan for country and bumpy roads as well as for long rides. In addition, the car can be rent, on demand, with the following accessories: navigation system (GPS), children’s chair, exterior trunk. If you are looking for a car to offer you the comfort, space and safety which you desire, contact us, 24/7, at the no. 073.505.7777 or on our website.